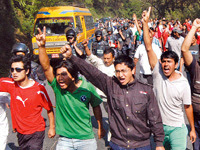 Kathmandu: Waste collection and removal got affected in the Kathmandu Valley today due to a general strike. More than 600 metric tonnes of waste is daily produced in the Kathmandu Valley of which the Kathmandu Metropolitan City alone accounts for about 350 metric tonnes. “We could not collect garbage from Dillibazaar, Baghbazar, Maitidevi and Old Baneshwor with demonstrations as demonstrators burning tyres in those locations,” said Shanta Ram Pokhrel, chief of the KMC’s Environment Management Department. Kathmandu: The British Gurkha camp in Pokhara has announced to offer free drinking water from its camp to the local people of Kaski to meet the current water shortage. As per the decision, the camp will provide up to 350,000 litres of free drinking per day. 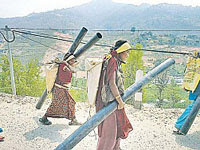 The flood in the Seti River on May 5 had damaged the main water pipes that supply water to the locals of Kaski. The British Gurkha camp, however, was unaffected by the flood. Kathmandu: The one most peculiar aspect that defines Kathmanduites is their habit of littering everywhere regardless of their education or status in society. Littering on the streets, parks, gardens and public places is a prime characteristic common to all of them. The discussion on prohibiting haphazard waste disposal in Kathmandu is ages old and although the measures taken in the past may not have yielded results, there are more and more people realizing the adverse impact littering has on our environment. Kathmandu: A week after the government evicted squatters from their settlements from UN Park at Thapathali, some 15 families received Rs 15,000 each as relief from the Department of Urban Development and Building Construction (DUDBC) on Monday. The government in January last year had tasked DUDBC with registering the squatters if they wanted alternative places. Kathmandu: The Baburam Bhattarai government has banned polythene bags in Kathmandu effective from Monday. Authorities have said anyone knowingly or wantonly violating the new directive would be brought to justice. The Kathmandu Metropolitan City (KMC) has been issuing official notices at public places and also through print and broadcast media to all people urging them to discard plastic bags, said Rabin Man Shrestha, chief of KMC Environment Division. 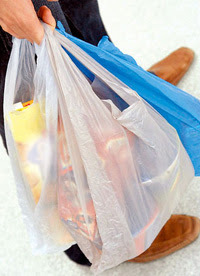 The ban aims at encouraging the use of environment-friendly bags made from paper and fabrics. Kathmandu: Prime Minister Baburam Bhattarai has assured the homeless squatters of relocating them in Chobhar in a couple of days. PM Bhattarai made such a pledge during his visit to the Thapathali area on Saturday where they were staying under the open sky for the five days. Last week, authorities had demolished the huts constructed by ‘landless’ people encroaching on the Bagmati river banks. Kathmandu: Three places have been selected on the outskirts of the Capital city to resettle the genuine squatters who were evicted from Thapathali four days ago. A team of officials comprising coordinator of the taskforce formed to evict squatters, Mahesh Bahadur Basnet, and chief of Department of Urban Development and Building Construction (DUDBC) finalised one place in Chovar and two in Gothatar on Saturday to relocate the squatters. Kathmandu: Various human rights organisations today expressed serious concern about the government’s act of evicting squatters from the banks of the Bagmati River in Thapathali. National Human Rights Commission (NHRC) asked the government to re-settle the squatters in a safe place at the soonest. In a press statement, NHRC further asked the government to provide treatment for those injured in yesterday’s clash with police. Kathmandu: The government has finally started evicting squatters living illegally on the banks of the Bagmati River. The first phase of the campaign began on Tuesday at UN Park in the Thapathali area in Kathmandu. A total of 251 houses were demolished with help from 2,200 security personnel from Nepal Police (NP), the Armed Police Force (APF) and the City Police. The joint force led by SSP Jay Bahadur Chand from the NP and SP Sanjay Rana from the APF used four bulldozers to bring down the houses. Kathmandu: Nepal is facing an acute energy crisis, which is hampering our economic development. Construction of big hydropower projects requires a huge investment. Therefore, the country can tackle energy scarcity through judicious utilisation of its abundant renewable energy resources. As a problem shared is a problem halved, Govinda Pokharel, executive director of Alternative Energy Promotion Centre (AEPC), shared his insight into promotion of alternative energy with Binod Ghimire. Kathmandu: Tension flared up at Hile Danda in Sankhu of Bajragyogini today after a violent clash ensued between riot police and local people protesting the construction of a Buddhist monastery in the area. A dozen riot cops and demonstrators were injured in the clash as riot police used force against the agitating locals to ‘bring the situation under control’. 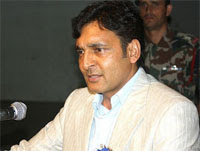 Lalitpur: Outgoing Minister for Local Development Top Bahadur Rayamajhi has said solid waste management will remain an alarming concern until social behaviour is changed. Speaking at a seminar on “Challenges and Opportunities of Effective Implementation of Waste Management Act-2068” in Lalitpur on Saturday, he said laws cannot be implemented until people’s conservative thinking is changed. Kathmandu: Water Expo 2012 kicked off at Direction Exhibition and Convention Center, Tripureshwar on Friday. The three-day expo is being organized to display new technological advancements in pollution and wastage reduction and recycling of water and to make general public aware of the importance of water conservation. 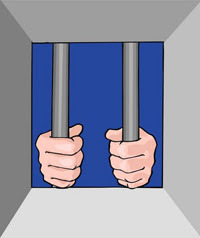 Kathmandu: Police have arrested three persons for dumping waste at a restricted area in the Capital on Wednesday. Security personnel deployed from the Metropolitan Police Circle, Jorpati, arrested Amisha Lama along with his two friends. Lama was arrested while disposing garbage in Bagmati River and on public land at Jorpati. Kathmandu: ‘Water Expo’ is going to be organized for the first time in Nepal. At the time when the dwellers of Kathmandu city are facing the shortage of drinking water, a three-day Nepal Water Expo 2012 is going to be held for the first time in Nepal to bring to the knowledge of general public the values, importance, uses and reuses of water in the modern context and inspire individuals, families, communities, institutions and government agencies to initiate measures of water conservation at respective level. As the Kathmandu Valley Town Development Committee (KVTDC) was receiving all-round applause for launching the fruit-bearing road expansion campaign in the Capital, the Baburam Bhattarai government formed Kathmandu Valley Development Authority (KVDA). Keshav Sthapit has been appointed the commissioner. The birth of KVDA automatically scrapped KVTDC. Kathmandu: The Australian government has decided to join the global call to support the world’s poor with improved access to safe drinking water and basic sanitation. Foreign Minister Senator Bob Carr on Sunday announced that Australia will join the global Sanitation and Water for All (SWA) Partnership, the Australian embassy in Kathmandu stated on Sunday. The announcement follows the SWA high-level meeting in Washington DC on Friday. Kathmandu: The government authorities claim that they are prepared to nip any possible acute diarrhoea and gastro-enteritis (AGE) outbreak before it goes out of control this monsoon. In the last five years, altogether 672 people have died, while over 100,000 have sought treatments during diarrhoea outbreaks between the months of May and July, according to the data compiled by the Epidemiology and Disease Control Division (EDCD) under the Department of Health Services. Ramechhap: Awareness of sanitation among people is on the rise in the district lately. For instance, unlike in the past, almost every household in Kathjor VDC has a toilet and the practice of defecating in the open is on the decline. Komal Bahadur Shrestha, a local resident, said tracks are no longer filled with human faeces as almost every family has constructed a toilet. 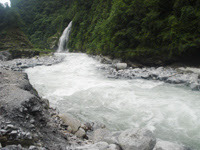 Kaski: The Kharapani area, which was swept away by the Seti flash flood on May 4, is yet to recover from the tragedy. 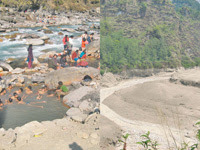 The tourist hub, which was visited by scores of tourists on a daily basis for enjoying the breathtaking scenes and taking a bath in local hot water pond, wears a deserted look after the flood swept away settlements, including Sadal and Kharapani, in the area located 21 kilometres away from Pokhara. Chautara: The Chinese Contractor Company responsible for the construction of diversion tunnel of Melamchi Water Supply Project has sought a two-year extension of the deadline for completing the tunnel construction. The tunnel construction and supervision consultant has presented the unofficial proposal of the contractor company to the Melamchi Water Supply Development Board for extending the deadline till December 2015. Bhairahawa: Locals of Butwal city have been hit hard due to the week long scarcity of drinking water after a water pump was destroyed by a fire last week. The distribution of water came to a halt after the water pump machine at Milan Chowk was gutted by the fire. The installation of new pump machine after the four days of the incident did not bring about much change to the situation. Ilam: The district headquarters of Ilam has been hit hard by drinking water scarcity owing to insufficient supply as per the increasing demand. The scarcity arose due to increasing population and age-old narrow-sized pipelines. While the municipality office has been installing new water pipelines, the existing projects are hardly enough to quench the thirst of its ever growing numbers of consumers. Itahari: With an objective of making Sunsari free from open defecation (ODF) by 2015, various organisations, stakeholders and local bodies have been visiting different villages of the district advocating the importance of toilets at each household. District Council of District Development Committee which has initiated the campaign is planning to declare the district free from the open defecation by 2015. Sindhupalchowk: Nobody can say for sure when Kathmandu denizens’ wish to get adequate drinking water supply from the Melamchi River will materialize. There are no solid grounds for predicting that the project will complete anytime soon. The much hyped project has been mired in controversy ever since its inception in 2002. The deadline of the project has been revised several times, which increased the project cost as well as verification claims by contractors. Kawasoti: As many as 50,000 people in the southern belt of Nawalparasi have been affected by drinking water with arsenic. They have been affected by the arsenic as they have no alternative to such water for drinking. A large number of population in southern part of Nawalparasi district drink water from tube well. Surkhet: Locals in Guthu VDC of Surkhet are struggling to cope up with a campaign against open defecation launched by several government and non government organizations because of insufficient water. Even households with toilets are not using them since there is no water to flush. “I did not have money to construct a toilet. As they said they were making this open defecation free area, I took a loan of Rs 10,000 from my neighbor to construct one,” said 70-year-old Kainturi BK. “But what is the use when there is no water to use in the toilet,” she added. Kavre: The administrative officer of Panauti Municipality became the target of Makaitar residents who were protesting the municipal decision to build a dumping site in their locality. Indra Prasad Adhikari, who had gone to Makaitar for a site inspection on Monday, was captured by the angry locals, smeared his face with black paint and paraded around. Is India's lack of toilets a cultural problem? India: Is anybody really surprised that nearly half of India's 1.2 billion people have no toilet at home? Not really. The India Human Development report has been saying this for a while. The situation is worse in the villages, where two-thirds of the homes don't have toilets. Open defecation is rife, and remains a major impediment in achieving millennium development goals which include reducing by half the proportion of people without access to basic sanitation by 2015. New Delhi: Vidya Balan, who received the Best Actress National Film Award for her role in 2011 Bollywood hit ‘The Dirty Picture’, will now play a role to alter the real dirty picture in India. Union Minister of Rural Development Jairam Ramesh has named the Bollywood actress as the brand ambassador in his campaign for improving sanitation. Water shortage in Kathmandu Valley is making life miserable for its inhabitants, forcing them to scamper for water everyday. According to data from the Kathmandu Valley Water Supply Management Board (KVWSMB), Kathmandu consumes 94 million liters of water during the dry season and 13.1 million in the wet season per day. No wonder it cannot supply water in accordance with the demand because that would require an additional 350 million liters of water per day. It never seems to amaze me how politicians and/or their political appointees get so carried away by exuberance of their own verbosity as reported in “Sthapit speaks out his vision of Capital city” (THT, April 30, Page 2). First, we had 601 people promising us a whole new world, A New Nepal, and look where that got us. We, as a people and as a nation have never been in the worse place in our entire history. Many people in Kathmandu suffer from stomach ailments and waterborne diseases. It is a well established fact that the major factor causing such problems is contaminated water. The problem becomes an acute one when various impurities are found to seep into the supply system. This type of contaminated water, even if it is boiled, is unsafe to drink. Kathmandu: At a time when shortage of water and pollution of water resources is hitting the citizens of Kathmandu hard, the three-day long Nepal Water Expo 2012 that took place at the United World Trade Centre (UWTC) from May 4 to 6, proved to be relief for these people. The event could be called a relief as it offered new technology with the help of which people could make maximum use of water, reuse or store water for future purposes. Some were new technologies while others were the known ones that people might not have paid much attention to. In my early childhood, my tutor once said on the richness of Nepal: “Our country is rich in water resources.” There is a perennial flow of water in 6,000 rivers and rivulets. The water of these rivers either originates in the Himalayan region or flow down from Tibet. The abundance of water resources makes us rich and proud. Today, the widespread variation in the use of water is something to ponder over. This variability particularly makes water and its uses more important, and that also puts water in the set of scarce commodities. Some days ago I saw a picture of the Prime Minister on the front page of a national daily busily cleaning the debris in the Bagmati River and trying to convey a message that we as a nation must show the determination to get rid of the dirt and filth that seems to be a part of our daily living. I do appreciate his efforts to symbolize a new trend and yet, the irony is that the sleaze and corruption that seems to characterize his government seems to have escaped his attention.